Chris Whitmore of Deutsche Bank issued a note to investors on Monday after he received a number of inquiries regarding the potential for Apple to pay out a special dividend. The company currently has $121 billion in cash, and it's expected to grow to $156 billion in fiscal year 2013, ballooning past $200 billion a year later. Special dividends can be a short-term boost for a stock, but they do not tend to have a lasting benefit to shareholders. Whitmore believes Apple is more focused on building a track record of predictable dividend growth. 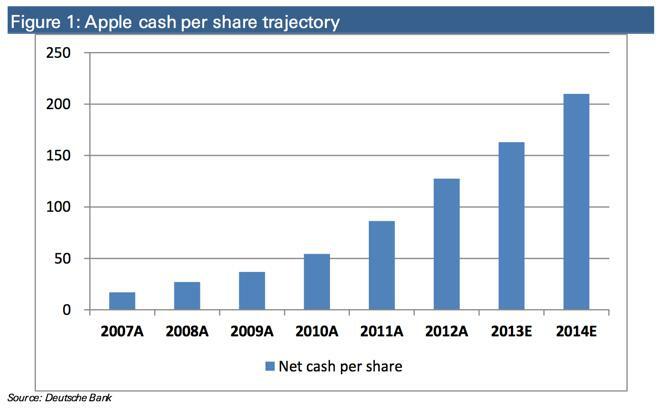 Another problem is about $83 billion of Apple's cash balance is offshore. The $45 billion Apple plans to spend on recurring dividends and share buybacks will be entirely domestic cash. The company announced in March its plans to spend $45 billion over three years on dividends to investors, along with a share repurchase program. The decision was a change of course for Apple, which had long refused to pay out a dividend to shareholders. Apple's quarterly dividend amounts to $2.65 per share, and payouts of $2.5 billion were issued to investors in August and November. They were Apple's first dividend payouts in 17 years. But Apple is also earning cash faster than it can pay out its $2.5 billion in dividends per quarter, which means its cash hoard continues to grow. As of the end of its fiscal 2012, Apple had $121.4 billion  a number that's expected to grow even more during the company's lucrative holiday quarter. Investors are clamoring for a special dividend from Apple because the tax rate on such payments may increase from 15 percent to about 40 percent in January if the President George W. Bush-era tax cuts are allowed to lapse by congress and President Obama's administration. However, Whitmore did admit that Apple has become increasingly "shareholder friendly," thanks in large part to its decision to pay out dividends. He views the company as an attractive buy for prospective investors, with a "buy" rating and a price target of $800.